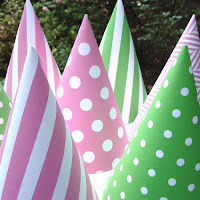 Maryland Pink and Green: Perfect Preppy Party! 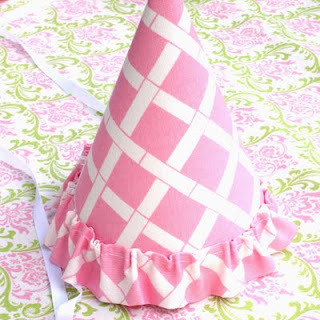 Aren't these party hats adorable? 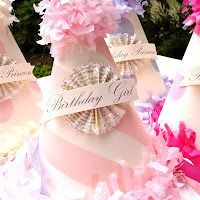 You'll have the most unique and preppy party in the neighborhood with these gorgeous party hats. 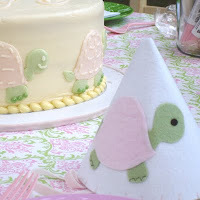 Kate Landers offers favors and treats for classic childrens' parties. You can see some of her creative ideas on her blog. She offers many personalized items including custom invitations, party ware, tableware, favors, and more! Your party will be complete with these lovely party goods. 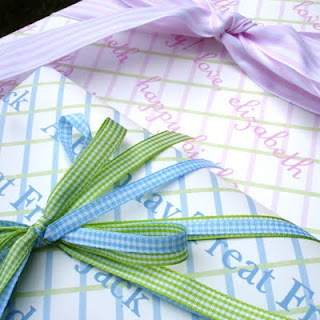 Although many of the items are geared primarily towards children, others are perfect for wrapping any gift or using at a bridal or baby shower. I love this personalized wrapping paper. I know that you're all itching to get a party hat for yourself and here's a great opportunity for you. Kate Landers Events is offering a giveaway for Maryland Pink and Green readers. In order to enter, you MUST be a follower of Maryland Pink and Green as well as Kate Landers Events. After visiting Kate's website, followers should leave a comment below this post about their favorite item from Kate Landers Events. You can also find Kate Landers on Facebook. Become her fan so that you've got the latest scoop and perfect preppy party ideas. This giveaway is open to all of my lovely readers who reside in the United States. Sorry, international shipping is not offered. The deadline ends for this contest on Friday, January 29, 2010 at midnight. I'll announce the lucky winner on Saturday, January 30. Best wishes to all of my lovely readers for a magnificent Monday. omg those party things are darling! I adore Kate's sailboat party! We are huge boaters and I would LOVE to do a sailboat party for my son, Miller! Following you both, and my favorite is the nantucket baskets. Love them. I follow you both and love absolutely everything on her site!!! You know I follow you... but with my two testoterone-y boys, these hats would NOT fly! Good luck to the rest of your lucky readers! Perfect timing, I am just starting to plan my Minnie's 3rd Birthday Party! So glad I saw this post! I follow you both now & also became a fan of Kate's on Facebook. 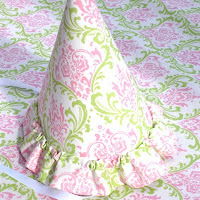 My favorite item is the Classic Fabric Hat, and close behind is the Darling Cloth Gingham Napkins! This is a fabulous line of products and a wonderful giveaway! I love the Custom Whimsical Crown - too cute! I really need those for me, as I am having a "BIG" birthday. Somehow, they would make it all that much more fun to swallow my age and bring out my inner child.